On Shaving - Lydia, Inc. Many times throughout our lives as men, it is necessary for us to shave. Reasons for shaving can range from military service to job/safety requirements. While there are some articles that say having facial hair may help land you a job (having to do with taking risks, or appearing more experienced), if your face rug is wildly out of control, or if your face looks like a puppy with mange, then shaving is your best option for job interviews. Being clean shaven will present a cleaner and more professional look than having a 5 o’clock shadow – unless you are applying for a lead singer position in a grunge band. There are a few tricks that can help to keep that clean look throughout the day. I learned some of these tricks in the military, a few others I picked up from diverse places. The first tip is to have a good razor. While personally I would prefer an old school safety razor or even a straight razor, not many people can afford those; though, the replacement blades for a safety razor are immeasurably cheaper than replacement cartridges. Gillette claims that their blades will last you a month each, and they have a shave club where they will send you four blades every four months. I have never been able to get their blades to last more than a week. My personal recommendation is Dollar Shave Club* with their $6 razor – that is $6 a month for 4 razors and the blades are better than what you buy at the store. 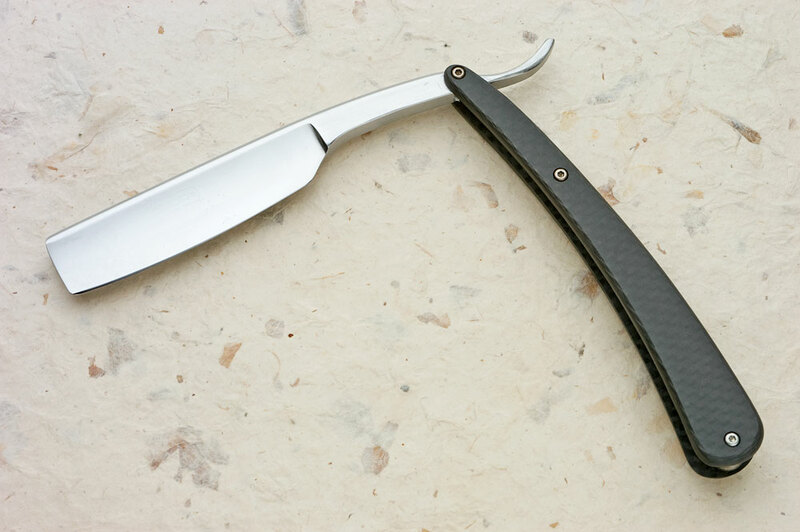 Having a good blade is important so you get a nice close shave and don’t knick yourself every time. Changing your blades weekly is equally important as having a good blade. The next tip is the kind of shaving cream to use. Forget the gels and foams. Go to Walmart and buy a cup and brush set. 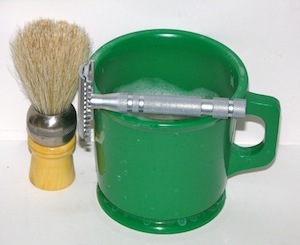 The shave soap lasts longer and can be better for your face. The brush will help exfoliate your face while raising the hairs for a closer shave. Later, you may want to upgrade to a better brush, but the ones from Walmart are affordable and will last with care. Also, for after the shave, forget the alcohol based aftershave. You might love the smell of Old Spice, but the alcohol will dry out your face, and may raise the hairs ruining the fresh shaved look. Go for a lotion that adds moisture and other things back to your face. If you still want the Old Spice smell then put a little on your wrists and rub them together, then apply a very miniscule amount behind each ear. Those spots are small enough that you won’t reek of aftershave, but still allow for a pleasant aroma. For the actual shaving, first take a shower, or wash your face with soap and hot water. The hot water opens the pores making for an easier shave, the soap cleans dirt so it doesn’t get in your opened pores. Lather up your face with shaving cream, but not too thick or you’ll shave cream, not hair. Use short, deliberate strokes and rinse your blade well. On the first run shave with the grain, following the contours of your face. Don’t forget areas around the jaw/ear and the lip/nose. Lather up again, and this time shave against the grain, lightly so as not to irritate the face. Inspect your face and neck to make sure you didn’t miss a spot. Then rinse your face with cool water – closing your pores to prevent blackheads and pimples – and apply aftershave lotion. If you are inclined to keep your facial hair then invest in a decent trimmer and trim a few times a week to keep stray hairs away. If you have a decently large beard then invest in some beard care products** like oil and balm to keep your beard from looking like Grizzly Adams – unless you are applying for the lead in a remake of Grizzly Adams. Oh, and make sure there is no debris in your face blanket during interviews. *I am in no way affiliated with Dollar Shave Club aside from having used their products. 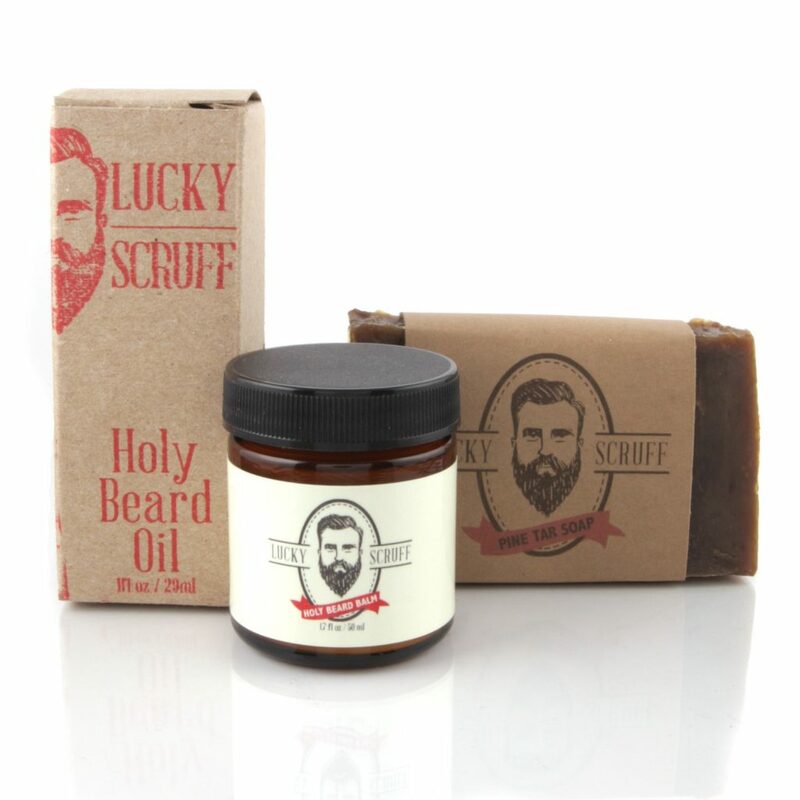 **I am in no way affiliated with Lucky Scruff Beard Co. aside from personally knowing the owner.